To make your gift online, use our secure online gift form. Vanderbilt accepts Visa, MasterCard, American Express, and Discover credit cards. If you would like to restrict your gift to a particular fund within the Basic Sciences (e.g., a specific lab’s research fund) please make a note in the special comments section of the online gift form. To mail your gift or pledge, print our giving form to include with your check, credit card payment, or money order. Call us at 1-866-882-FUND (3863) to make an annual gift. To set up an electronic bank draft, call 1-866-882-FUND (3863) or use our printable form. Learn more on transferring gifts of stocks and securities. Please call (615) 875-1155 with any questions. For information on planned gifts, matching corporate gifts and donor advised funds, please contact Taylor Wood, Associate Dean for Development, at (615) 343-5648 or taylor.h.wood@vanderbilt.edu. 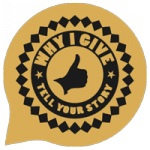 Why I Give — Because you play such an important role in shaping the future of Vanderbilt, we would love to hear your story about why you give to Vanderbilt.